My "Silver Strawberries" stole is complete! 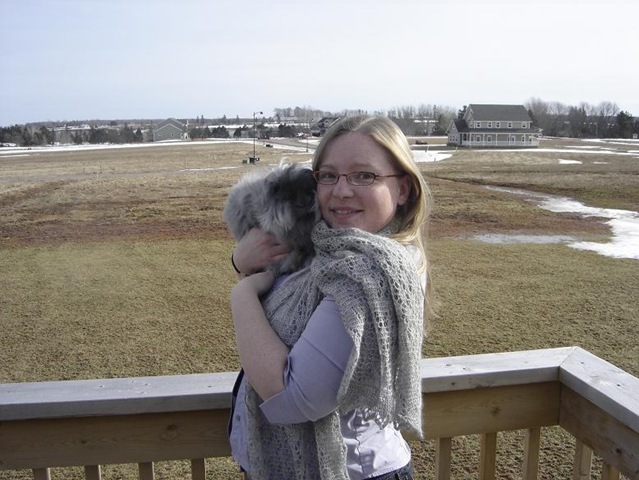 The finished shawl is so light and soft... just like the Bunny it was grown on! I guess I should start back in the beginning: The yarn. When Ruttiger was a baby, and going through his first Molt I was obsessed with keeping as much of his first coat as possible. Many people say that the baby fur isn't much of a yield, so it isn't worth keeping really. 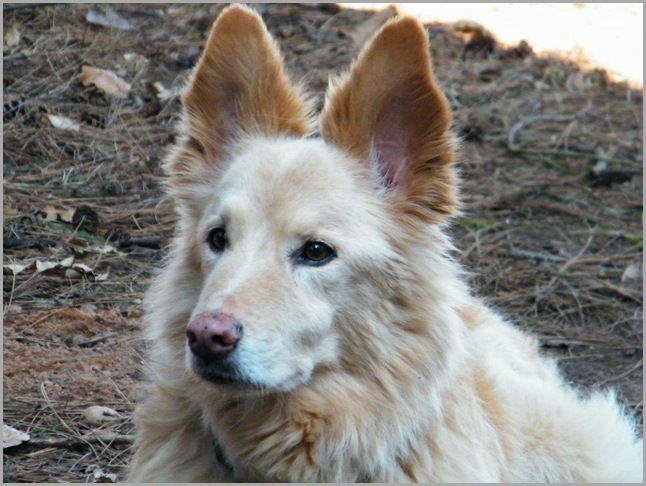 I was unbothered by this though, and carefully kept every wisp of fur off of the brush and plucking carefully stored away in a box for safe keeping. In the end, I didn't have that much of it (maybe 2 - 3 ounces) but I really wanted to make something special out of it some day. 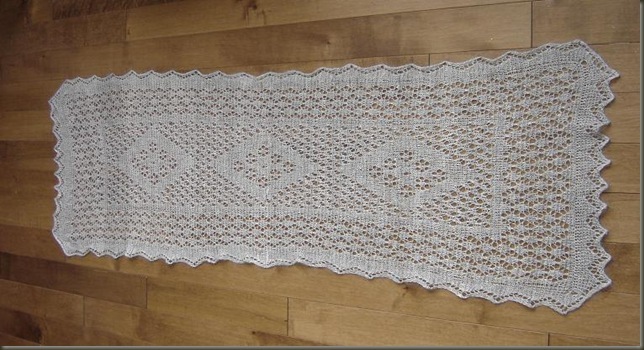 After doing much research about Orenburg lace, I thought maybe this might be a good way to use it up. Traditional Orenburg lace is made from a specific breed of Goat's down, spun by hand cobweb/gossamer weight, and sometimes plied with silk for strength. 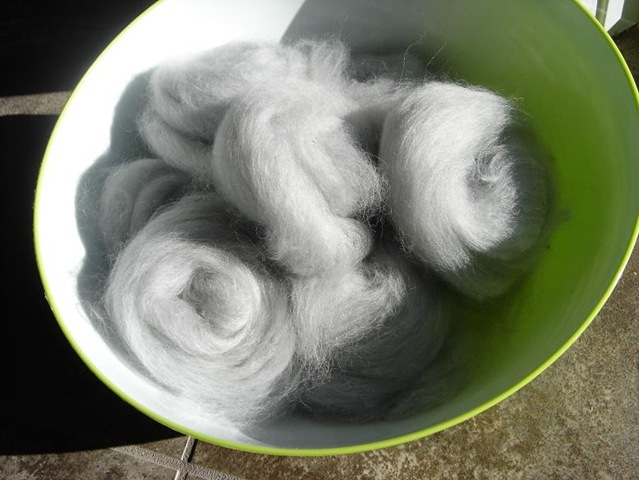 I know Angora is no substitute for mohair or goat down, but I *did* have an abundance of it, so I thought maybe I could try it anyways? 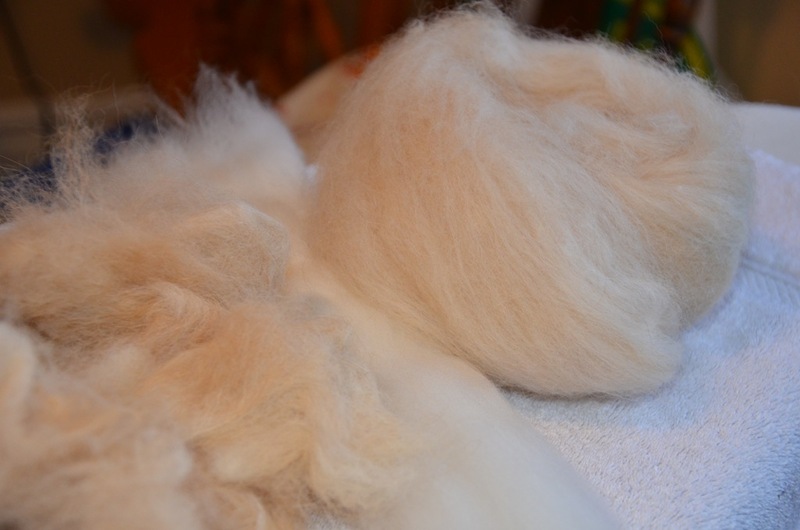 I took poofs of Ruttiger's fur and lightly carded them with pinches of steely carbonized bamboo and creamy soft Merino wool, hoping that those few pinches of longer fiber would lend some strength to the delicate angora strand. 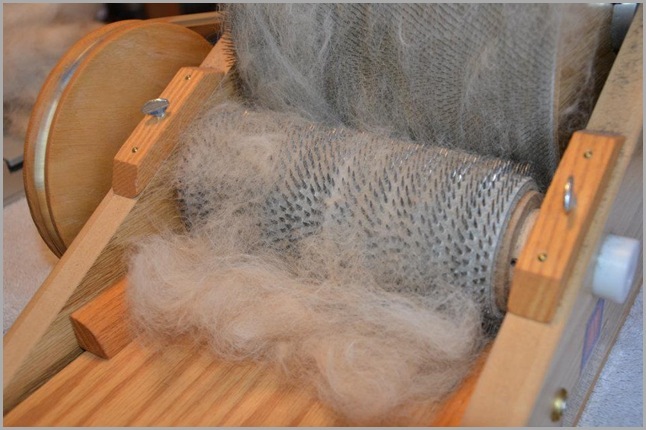 I'd estimate that those small bits of bamboo and wool would amount together to no more than 5% of the total weight combined. For added strength and shine, I spun a very fine single of pure white Tussah Silk. 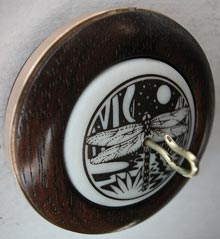 I've learned that I absolutely love spinning silk on my Golding Dragonfly ceramic inset spindle. 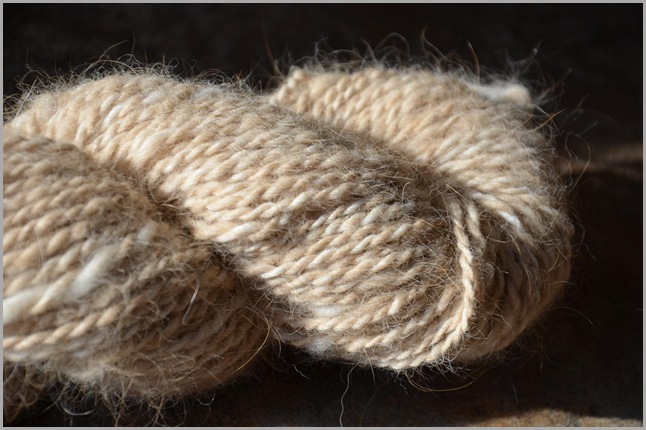 It's just the right weight for spinning fine yarns - 0.7 ounces - and is perfect for portable spinning too. This little guy tucks perfectly into my purse! 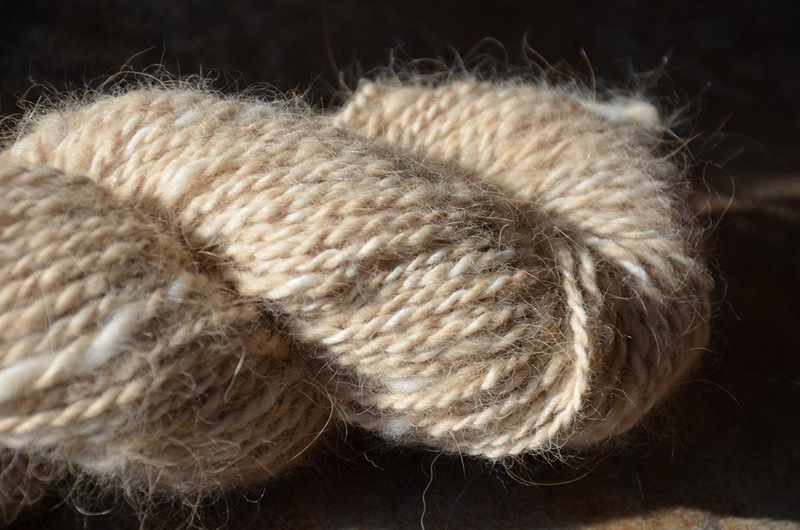 The plying process was a bit challenging for this yarn... I thought doing it on the wheel made more sense, but I found it really difficult to apply the correct amount of twist. My first ball of yarn was quite underplied, though I thought I was probably twisting way to much. I decided to ply the second and third balls of yarn on a heavier Golding spindle. This was surprisingly much easier, and actually faster too. Those two teensy plies took a lot more twisting than I would have imagined. Once the yarn was completed, I decided to hunt for a pattern. 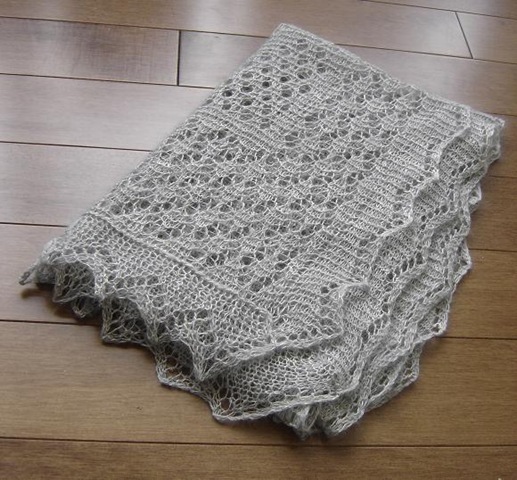 I had purchased Galina Khmeleva's book Gossamer Webs Design Collection, but the patterns in that book are quite large, and a lot more complicated than I wanted for a beginner Orenburg project. I saw online where another Ravelry user had drafted a chart for a beginner stole with some traditional stitch motifs. Basically it was just a chart, no instructions. Since I had the book to use as a reference, I decided that it would be a learning experience... and just went for it! 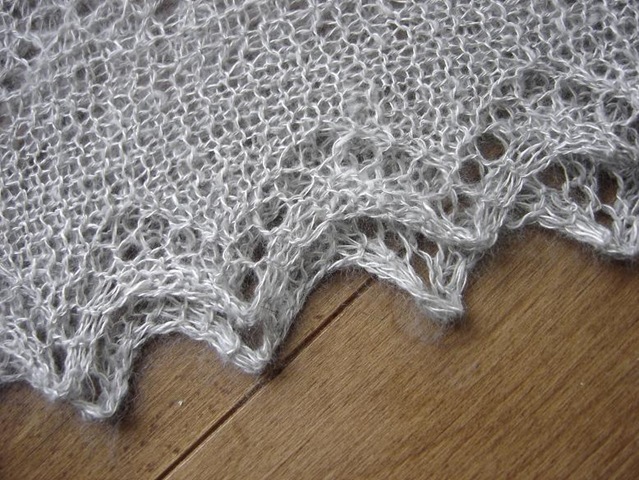 In retrospect, I really don't think anyone could work this shawl from the schematic-style pattern alone. You would need some help, either from a real live Russian knitter, or a book of some sort to be able to make sense of it. 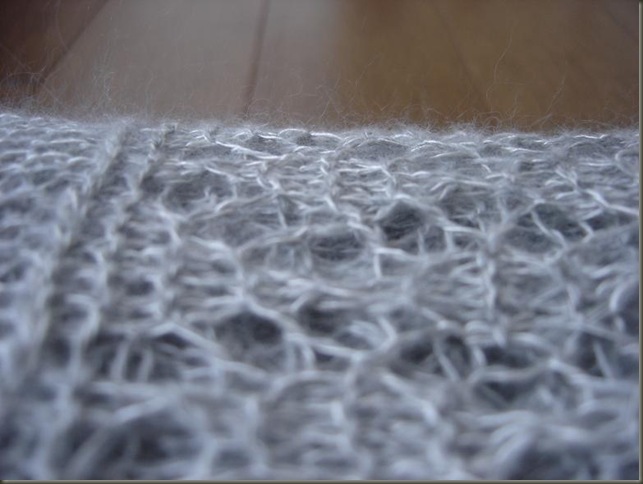 Having said that though, it was a very enjoyable knit, and I learned so much doing it! 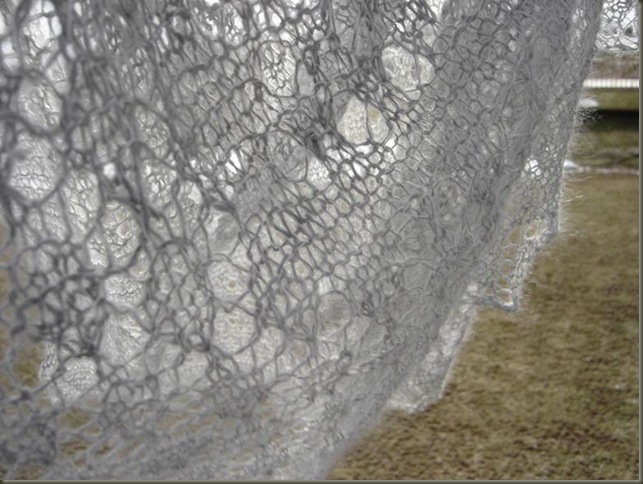 I know that someday I want to try one of those super-large gossamer wedding ring shawls. 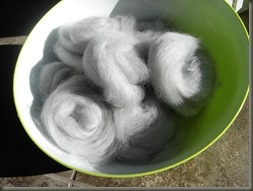 I think I need a bit more practice at gossamer spinning, but I will definitely make one some day! Let's start in the beginning... the edging! Orenburg shawls are knit with the edgings in one piece. 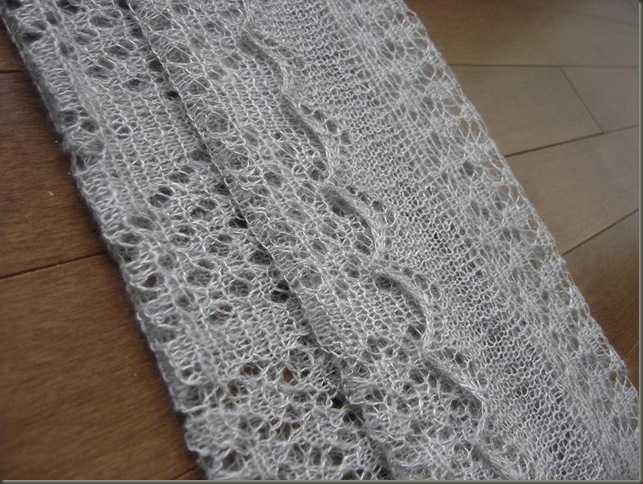 You begin the piece by knitting the bottom edging, turn the corner and pick up stitches back across for the main lace panel. Then you knit the edge all the way up both sides as you go, then finish the piece off by working in the body stitches into the border as you go across. It sounds devilishly complicated, but is quite straightforward if you follow along with a reference like the Gossamer Webs book. 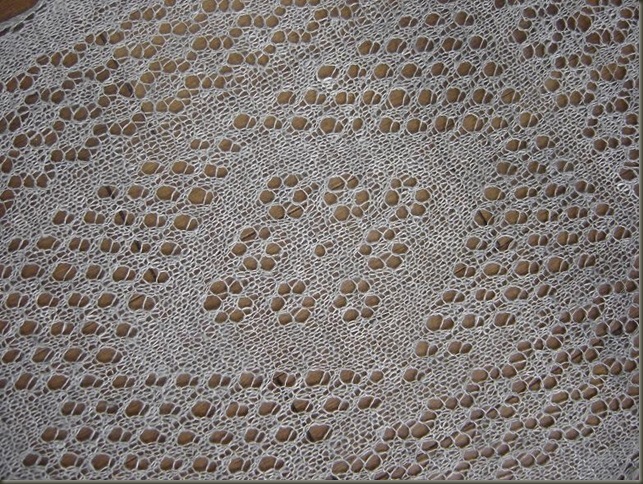 Apparently most Orenburg Gossamer Shawls use a "5-hole" tooth border. Mine was the simplest version... but you can count above... 5 holes in, then 5 holes out. repeat. 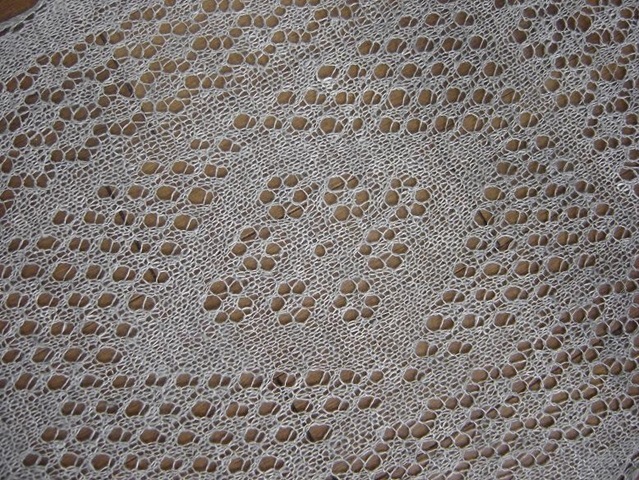 The main body of the shawl features several traditional lace stitches. 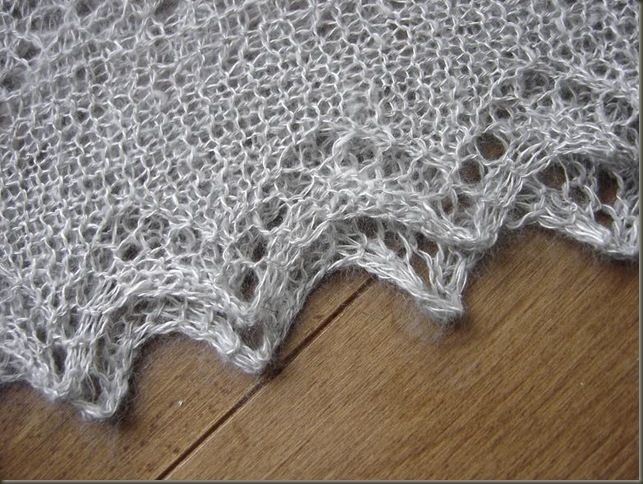 Orenburg lace is knit in "garter" stitch. 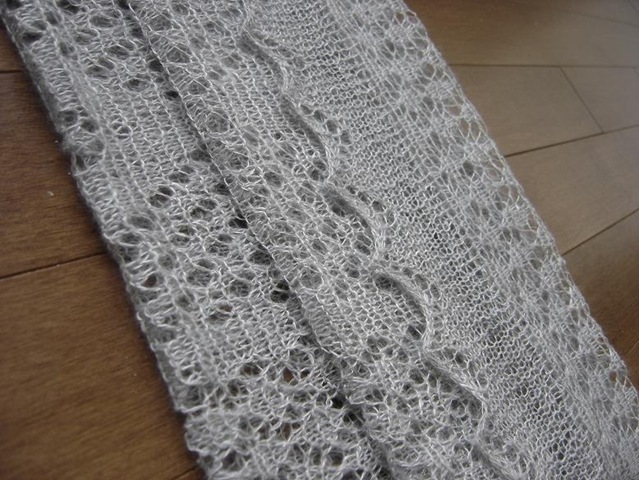 Unlike other traditions where the "wrong side" rows are mostly purled across, when working in garter lace, you actually knit the wrong side rows. This felt quite weird at first, but was easy to get used to. I wasn't sure how I would like the finished look, but after blocking, the garter opens right up, with a quite pleasing finished appearance! As the name would imply, this stole features the "Strawberry" motif for the edging and the little flower-looking parts inside the graphic diamonds. The other main features is a "peas" pattern - which actually has a pattern stitch on both sides of the piece. This took a little getting used to, but was fun to challenge myself to pay attention to both sides of the work. The finished shawl blocked to 24 x 55 inches and only weighs 1.8 ounces! Wearing it feels like wearing a cobweb around your shoulders. 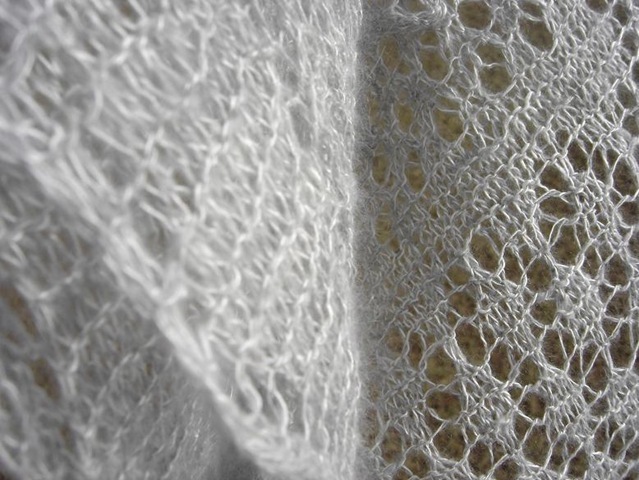 It is so light and airy... but with the silk it's stronger than it looks. I've been wearing it around a bit, trying to gauge how well it will last. I don't want to wreck it, but at the same time, I can't bear the thought of it hiding in a box forever either! Trying to photograph it... the light wind was enough to toss the stole in the wind! I love the way it fluttered along in the breeze. See how the sun picks up the silk shine? All in all - another successful lace project. I learned a ton, and plus the stole is extra special because it's made with my Baby's fur! That makes it an extra special item. This is the first project where I've raised the animal, prepared the fiber, spun the yarn, knit the stole, and completed the entire thing myself! Yay Me! Having completed one skein of yarn from my Alaskan-Malamute-Challenge over the past weekend... I decided to get started on the goods! The completed skein had somewhere between 100 - 125 yards, which as I suspected was more than enough to make the hat. I chose to use the Noro spiral one-skein hat by Manuèle Ducret - which is a simple free pattern, graciously offered by Manuèle over on her website. I thought it might be a complicated knit, but was surprised and delighted by the simplicity of it all. I decided to work at my own gauge though, and cast on in multiples of 8 until I was pleased with the size of the cuff. I think I settled on 104 sts in the end. I'll have to measure the needles I used, because honestly I just grabbed a pair that "looked" appropriate in size for the yarn. Sometimes eyeballing it *does* work for me! 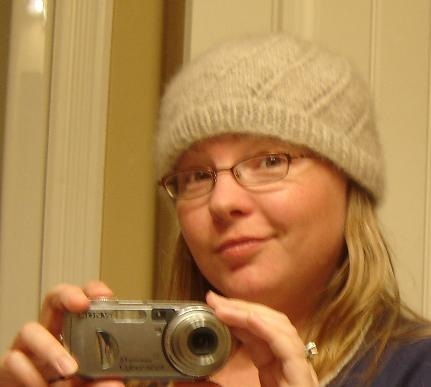 The Hat itself is quite fuzzy, with a light soft grey halo. I've been quite surprised with how soft the dog fur yarn actually is! 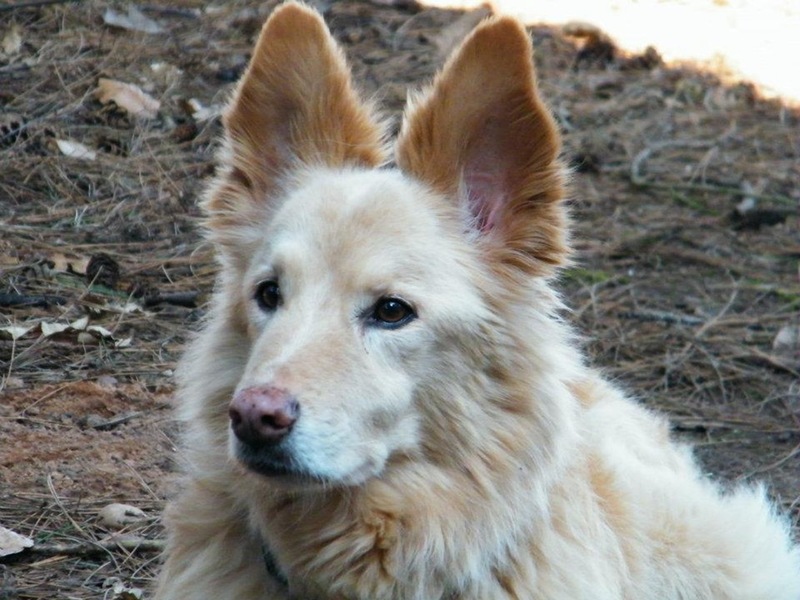 The dog's owner was considering having the hat lined with some sort of soft wool (maybe angora or alpaca) but I don't think the hat will really need it. Just wearing it around the house for photos, my head was toasty warm, almost to the point of being uncomfortably warm! I'll have to run it by her, but I think she will be pleased with it as it is.